Our Oswestry based shot blasting facility was launched in conjunction with our powder coating plant in 2011. * The maximum size of items for shot blasting will mostly depend on how easily they fit into our shot blasting booth. Please contact us to check that larger items close to the booth dimensions will fit. 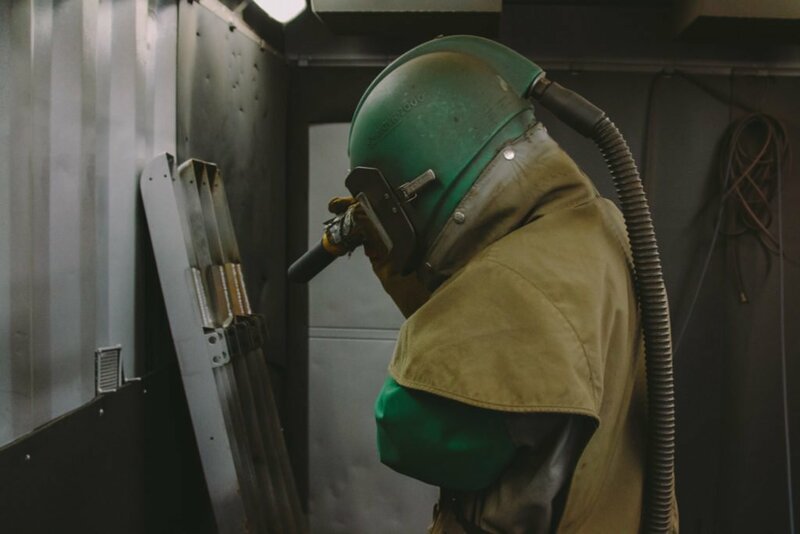 Shot blasting is our method of pre-treating steelwork that is to be powder coated only (not first hot dip galvanized). Shot blasting the steel surface both cleans and keys it in preparation for the powder coating process. Without shot blasting the adherence of the paint to the steel would be less effective. Shot blasting is also an excellent way of cleaning steelwork of oil, grease, old or unwanted paint systems. It is usually the first step when customers wish to refurbish all types of old steelwork whether this is gates, railings, vehicle chassis, domestic radiators, etc. Another use for shot blasting is preparing steelwork for a thicker hot dip galvanized coating. Hot dip galvanizing is an unrivalled coating system for protecting steelwork against environmental corrosion however, in some very extreme environments that require extended life to first maintenance systems shot blasting steelwork first can increase the galvanized coating thickness by up to 65%.